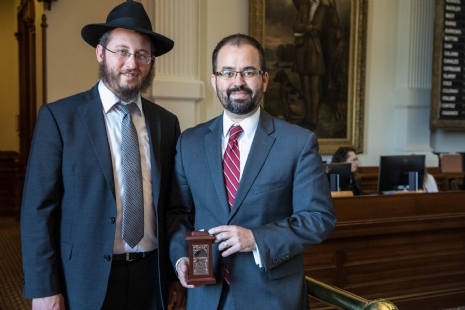 On Tuesday I joined twelve fellow Chabad rabbis from across the great state of Texas in our Capitol to participate in the recognition of the Rebbe’s upcoming birthday, 11 Nissan (observed this year on April 16), as Education and Sharing Day in Texas. In 1978, President Jimmy Carter started an American tradition honoring the Rebbe by proclaiming an annual day of reflection for all Americans. Every US president since has followed this tradition annually in tribute to the Rebbe’s valuable contributions to the national conversation about education. 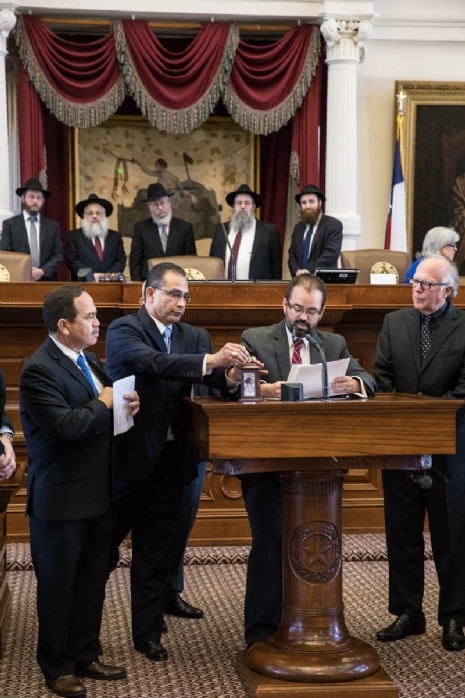 This year, Governor Greg Abbott signed such a proclamation and both the House and Senate have passed resolutions about Education and Sharing Day. 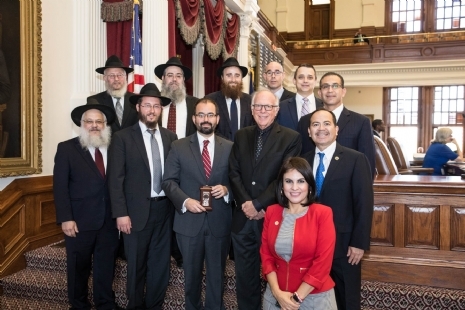 Rep. Joe Moody from El Paso authored the resolution (HR 1002) in the House of Representatives and, surrounded by fellow lawmakers, explained that the Rebbe taught that education, in general, should not be limited to the acquisition of knowledge and preparation for a career. Instead, the educational system must pay more attention — indeed the main attention — to the building of character, with emphasis on moral and ethical values. It was a beautiful morning and a meaningful event to participate in and I believe their words speak for themselves. In El Paso, Mayor Dee Margo signed such a proclamation as well. As we celebrate the Rebbe’s birthday on Tuesday, reflect on how you can make a difference in the lives of others. Add in Tzedaka giving and Torah learning and share these ideas will everyone you know. Approaching Pesach it is certainly appropriate to reach out to Jewish friends or acquaintances who may not have a Seder and ensure they find somewhere to participate. We live in a polarized society and many bemoan the fact that the current political climate is tearing apart families, communities and neighborhoods. The Jewish community suffers the same issue and this week’s parsha sheds light on how we can deal with a certain aspect of this situation..
Is there justification to this approach? In this week’s parsha we learn about the laws of “Tzaraat.” Although it is commonly translated as leprosy - it was not leprosy at all. It was a miraculous skin condition for which a dermatologist was never consulted. When the strange white spot appears on someone’s skin a Kohen determines if it is “Tzaraat” and if the individual is a “Metzora.” A Metzora is considered ritually impure and isolated from the rest of the community until the spot recedes and the Kohen declares him or her cured of Tzaraat. This miraculous condition is a punishment for speaking “Lashon Hara” - evil talk; gossiping and peddling negative information about people. Since this person caused strife and discord in the community, this person is afflicted with “Tzaraat” and secluded from others until he or she repents and changes their evil ways. There are times when the Kohen is obligated to postpone seeing the prospective Metzora until a later date. If someone notices these strange spots during a festival the checkup is delayed until after the festival. If a groom notices these spots during his wedding, the Kohen is approached only after the Sheva Berachot - the seven days of the marriage celebration. Now, the appearance of these spots suggests that this person is a gossiper and a real threat to the community. How can his banishment be postponed? The fact is that declaring this individual a “Metzora” would disrupt his or her ability to properly celebrate the festival or for the groom to fulfill the mitzvah of rejoicing with his new wife for the first week of marriage. Even though we are dealing with someone who is truly problematic, their mitzvah observance is valuable to G-d and we must be careful not to disrupt them. Even if you perceive a fellow Jew to be a real troublemaker, there is no license to disqualify a mitzvah he or she does. On the contrary, utilize every opportunity to encourage such a person to do more mitzvot, because every mitzvah is precious to G-d. This is not an indictment of humanity, rather an embrace of our inherent imperfection and our ability to fix what we broke. Approaching Passover it is customary to read two Torah portions during Shabbat synagogue services in addition to the standard weekly Torah portion. This week, after reading Parshat Shemini we will read a portion from the Book of Numbers about the laws of the Red Heifer (Parshat Parah) and next week, after reading Parshat Tazria, we will read a portion from the Book of Exodus about the Jewish calendar and the first Paschal Lamb (Parshat Hachodesh). The purpose for these extra readings during the Holy Temple era was to remind the nation that Passover was approaching and the Paschal Lamb - the most important element of the Seder at the time - needed to be prepared accordingly. Since the Paschal Lamb was only offered in the Holy Temple, and one must be ritually pure before entering, we read about the Red Heifer - the centerpiece of the ritual purification process - a week beforehand. Why was the reading of ritual purification standardized for the entire nation? Was it assumed that most Jews were ritually impure in the lead up to Passover? Although the specific need for purification varied, the availability of the Red Heifer ashes for the purification process is considered a Jewish national treasure. Why? Because everyone is susceptible to ritual impurity and everyone must know that - there is a way to correct the problem and then participate in the celebration of our redemption on Passover. Today, in the absence of the Holy Temple, when ritual purity through the Red Heifer and the offering of the Paschal Lamb is not physically possible, we continue this annual pre Passover tradition, and the joint message of these two readings highlights the key to self perfection and global redemption. Metaphorically speaking, ritual impurity can be compared to sin and the ritual purification process can be compared to repentance. It is possible for a human being to live a sinless life and never need to do Teshuva (repentance), just as someone can live a life of ritual purity and never need the ritual purification process of the Red Heifer. Nevertheless, Teshuvah is a gift for everyone. Imperfection is not a liability - it is the first step to perfection. The imperfect are empowered to perfect a profoundly imperfect world and usher in an era of global redemption for us all. Today is the day after Purim. Is Purim truly no more? Haman cast his lots two days before Passover and scheduled the Final Solution for eleven months down the line. Mordechai and Esther swiftly sprung to action and within three days Haman was hanging from the gallows, but his murderous decree was still very much alive. Since it was signed with the king's signet ring, so long Achashveirosh remained in power the Jews still faced a terrifying end. Even after Esther begged and pleaded that he rescind the decree, the mighty king demurred claiming it was against “the process.” Once a decree was stamped with the royal signet ring it was unchangeable. For two months Mordechai and Esther petitioned incessantly, until Achashveirosh agreed to issue a counter decree that the Jews should defend themselves on the day they were condemned to death. By no means had the danger passed until they were victorious the next year. The decree had an interesting loophole. It only targeted “Yehudim” which referred specifically to Jews who refused to become heathens. A Jew that would forsake his or her faith in G-d would be spared death. Nevertheless, not one Jew used the loophole. It was the first time that the entire Jewish nation faced such a test of faith and they passed it with flying colors. For a full year, every single Jew clung to the Jewish faith under penalty of death. It emerges that the miracle of Purim did not only unfold in the halls of power. It was manifest in the behavior of every Jewish man, woman and child for the duration of an entire year. Their deepest connection to G-d was on full display every single day. More than any other holiday, Purim teaches us that Torah and Mitzvot are not exclusive to special times and places. Judaism is not only relevant on Shabbat and Festivals, in the synagogue, around the seder table or next to the menorah. We are Jews every moment of the day, wherever we are. Turns out that every day is Purim. We have all experienced it and are probably guilty of it to some extent. “Chutzpah” is so ingrained in our social fabric that dictionary.com explains to the uninitiated it can be used to describe audacity, nerve, impudence and gall. I believe the original Hebrew term was so widely adopted, because “chutzpah” really refers to something much deeper and more sinister than simple brazenness. As this is the Shabbat before Purim, during synagogue services we will read a short portion titled Parshat Zachor form the Torah after reading the weekly Torah portion. These three verses toward the end of Deuteronomy describe the mitzvah incumbent upon every Jew to remember and never forget what the nation of Amalek did to us shortly after the exodus from Egypt. Literally weeks after the Israelites were liberated from Egyptian slavery, the Amalekites journeyed hundreds of miles from their homeland to wage war with them in the wilderness. The attack was unprovoked and completely unjustified as the Israelites were not poised to inherit their land and posed no threat to them at all. Besides, the Amalekites were well aware that they would lose, so why did they do it? Our sages compare the Amalekite tactic to the scenario of a boiling hot tub that everyone was afraid to dip into until one nut-job jumped in. Even though he got severely burned, the water was no longer that intimidating to everyone else. The Exodus from Egypt and the Splitting of the Sea were such monumental events that all the nations cowered in fear and the Israelite morale was at an all-time high. The miraculous display of divine power ensured that no one would dare oppose them as they advanced to Sinai to receive the Torah and then on to Israel to inherit their promised homeland. It also ensured that there would be no internal resistance to the spiritual journey they were experiencing. The Amalekites sought to disrupt this global perception and to destroy the Israelite morale by launching their suicide attack, and they were wildly successful. This is the epitome of “Chutzpah:” disrupting something positive for no reason at all. How to respond to such internal chutzpah? With positive chutzpah. Do an extra mitzvah - for no reason at all. Learn some more Torah even if your schedule is overwhelming - just because. Increase your tzedakak giving even if the bank has not been growing lately - simply out of chutzpah. It’s the only language Amalek understands. Earlier this week a friend of mine connected me with a student of his who was moving from the east coast to San Diego, driving through El Paso on Monday evening. Yaakov was interested in learning some Torah with a Rabbi during his trip and my friend suggested he stop in El Paso for a quick Torah class. We communicated throughout the day and soon realized that he would get here late at night so I suggested he stop for some dinner at our home and continue on his way. Dinner was delicious, the conversation refreshing (we spoke plenty of Torah subjects) and Yaakov left with two cupcakes and some recommendations of online lectures for the rest of the drive. It’s common for road trippers to find entertainment along the route and I was impressed that Yaakov chose to seek out a Torah class, in addition to the online classes he was listening to during the drive because he wanted the trip to be a Jewish experience: To stop in a town and learn Torah with a real person. 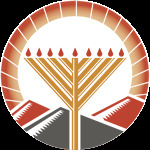 In this week’s parsha we learn of the inauguration of the Mishkan, the tabernacle, which served as a divine dwelling space within the Israelite camp for close to forty years. The final verse describes the divine cloud that hovered over the edifice signaling G-d’s presence. The Tabernacle was only erect when the Israelites were encamped. Why then does the Torah use the word “journeys” when referring to their encampments? Because for a Jew the journey from Point A to Point B is as important and consequential as the point of departure and destination. At every step of the way there are ample opportunities to serve G-d. Whether it is joining a prayer service on the road, learning Torah with a Jew or inspiring a fellow traveler to do more goodness and kindness there is always a chance to make a real impact. It is an empowering message yet one that demands much moral strength to apply on a constant basis - but the reward is limitless. I never thought setting up a fence could be an emotional event, but this Monday was special. 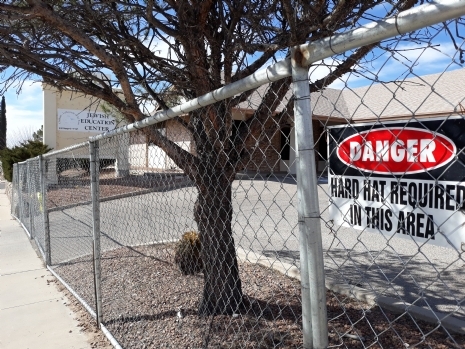 A crew of workers set up a fence around the front area of the Chabad property on Escondido and the landscape of Jewish El Paso has changed forever. The idea of a brand new Chabad Lubavitch Center for Jewish Life has been brewing for many years and the community is abuzz about the campaign for quite some time already, but the simple act of surrounding the construction site was a game changer. We’ve moved forward from the planning stages. I confess that although I am intimately familiar with the demolition plans, I get excited with every carpet ripped out, every piece of plywood taken down and every shingle knocked off the roof. The information we read in this week’s parsha Vayakhel is extremely familiar. The construction plans of the mishkan (tabernacle) delineated in the Torah over the past three weeks is repeated almost verbatim, to the point that Rashi, the epic commentator has very little to comment on since all the information was previously explained. Why the detailed repetition? Beforehand the mishkan was a plan and now the Israelites are making it a reality. Every step of the actual construction is exciting and worthy of mention. Construction sites are busy places. Many people with diverse abilities and credentials participate in the daily goings-on. But there is one thing that unites everyone on site - the hard hat. Beyond the practical safety concern, I believe the fact everyone is wearing the same hat illustrates a vital dynamic necessary to ultimate success; they are all united for one purpose. Everyone has a specific role, but they are members of the same team. The name of this week’s parsha “Vayakhel” means to gather and unite. Before Moshe shared the divine plans and delegated responsibilities he gathered everyone together to illustrate how this important goal of creating a divine dwelling within the camp is achieved. First and foremost the Israelites must appreciate and digest the fact that they are a single unit. Not a coalition of diverse tribes and factions, but a community bound together at the core. This same idea is reflected in the broader mission we have as a nation. We are empowered to reveal G-d in every detail of reality through learning Torah and observing Mitzvot. But to succeed we must appreciate that we are part of a large team and everyone in the team needs to be actively engaged. So when picking up the tools needed to observe a specific mitzvah, remember to put on your “hard hat.” Be sure to share it with another - because every Jew is wearing a hard hat on the grand construction site of making our world a dwelling place for G-d.
On Tuesday we celebrated the marriage of my sister Leah to the wonderful Yanky Baron and it was a beautiful affair. The Jewish wedding ceremony is conducted under a Chupa (canopy) with a plethora of nuanced customs all meant to emulate (in various ways) the wedding between G-d and the Jewish Nation at Mt. Sinai 3,330 years ago. The event called “Matan Torah - The Giving of the Torah” was not merely the communication of ideas and laws; it was the moment we became one with G-d.
On the surface, G-d gave us the Torah to enable us to reveal divinity in every detail of reality and to live life on a divine mission. If this is the case, give us the book, teach us how to learn and apply it and wish us luck in their mission. Must we really be married to G-d to succeed? Following “Matan Torah,”, Moshe was summoned to ascend Mt. Sinai and remain there for forty days and nights to learn the rest of the Torah - 603 more commandments and their myriads of details. The Israelites miscalculated Moshe’s ETA, panicked when he did not return on time and were manipulated into creating a Golden Calf and serving it as a deity, in direct violation of the most serious prohibition against idolatry. G-d was enraged and notified Moshe that the nation would be wiped out and a new and improved nation would emerge from Moshe’s descendants. Moshe would hear nothing of it. “If they are not granted forgiveness, erase me from your book (Exodus 32:32)”. In other words - kill me first. He did not justify their catastrophic sin nor did he seek to minimize its severity, but he valiantly declared that the destruction of the nation would happen only over his dead body. (Read more about this in last year’s message). G-d relented but stipulated that the Divine Presence would cease to dwell in the Israelite camp for their own safety. If the Divine Presence dwelled within them, another sin would be fatal. An angel would lead their journey to the Promised Land instead. And about the high risks of further sin and further divine vengeance - this was Moshe’s answer: If they will sin again - G-d will pardon them again! This is the bottom line of Moshe’s argument. The Jews did not enter into a behavioral relationship with G-d. We became family. This is not to suggest that the rules can be taken lightly, but our relationship is not terminated due of bad behavior. Family finds a way to work things out. Nurture a loving relationship with G-d through learning more Torah and doing more Mitzvot, and if you mess up on the way, know there is always a way forward. It happened. The unthinkable. My phone fell into water for 5 seconds. Seems like not such a big deal - but it was. Most of the features worked except for voice calls. Ironic? The little water that seeped into the forbidden territory of my phone’s innards upended my morning schedule and I found myself in the nearest T-mobile store trying to get myself back on the grid. Thankfully the phone was insured, but a replacement would take time to arrive and I needed something ASAP. The helpful and well informed sales rep advised me to first file the insurance claim and only then switch my sim card to a new device. Otherwise the insurance company satellite won’t pick up the correct signal from the damaged phone. Long story short, I didn’t ask too many questions, followed their advice step by step and less than an hour later life was back to normal. In this week’s parsha we learn how Aharon and his sons were ordained as the Kohanim (priests) to serve in the Mishkan that was being constructed in the desert. Only they and their descendants are authorized to offer sacrifices and incense and to execute a host of other rituals observed in the Holy Temple. Plain and simple. If the formula is not followed accurately, the Mishkan is a waste of time. Allowing a few drops of water to invade my phone caused it to malfunction. Had I rushed to switch my sim card to a substitute device before submitting my insurance claim I would lose out on the benefits of the plan. So I was glad to follow the sales rep's advice which made for a hassle free experience. My newly installed water heater was useless because the wrong valve was open and an email I recently sent was never delivered because I typed .con instead of .com in the address. The same is true about Judaism. There is a specific formula to Torah study and mitzvah observance and it is crucial to do it right. No need to panic. Mitzvot are fairly easy to observe when done accurately and Torah wisdom never conflicts with reality when understood in proper context. I recently presented the Kitzur Shulchan Aruch (abridged version of the Code of Jewish Law) as a gift to a Bar Mitzvah boy, explaining that this was the most important book for a Jew. If you are stuck on an island and need one book that will guide 98% of your religious Jewish life, the Five Books of Moses will not be very helpful. You need the “Code” to explain how it all applies in real life. Nevertheless, the Five Books of Moses are the anchor of our lives and the text we deal with on a constant basis. Not only do we read the weekly parsha on Shabbat during synagogue services, the entire week is defined by the parsha. For example: “The sixth day of parshat Teruma” is a legitimate description of today’s date in traditional Jewish circles. It follows that the content of every verse in the Torah contains relevant meaning to us here and now. Although this temporary structure, known as the mishkan, served as a divine dwelling for many years, it was not the ultimate realization of the command to construct a sanctuary. Certainly the main elements of the mishkan were later incorporated in the Beit Hamikdash (Holy Temple) in Jerusalem, but the wooden beams and beautiful tapestries were rendered obsolete. Why then does the Torah devote hundreds of verses to describe the mishkan down to the beams and tapestries in such intricate detail? Because the temporary mishkan makes the whole idea of a Beit Hamikdash relevant in every time and every place. The Beit Hamikdash represents the fact that G-dliness becomes a revealed part of our material lives. Just as a physical edifice becomes a dwelling for the Al-mighty, our personal lives can and must become reflections of a divine purpose. Had the concept of a divine dwelling debuted in the holiest spot on earth - in Jerusalem - then our personal divinity would only be possible once we achieved personal spiritual perfection. But most of us are imperfect. This is why the mishkan was constructed in a desolate wilderness. This is why the divine dwelling debuted in a space devoid of nourishment and rife with dangerous snakes and scorpions. To prove that even if one feels spiritually lifeless, with a shameful history filled with proverbial skeletons, he or she is capable and obligated to begin the task of creating a divine space within. During Torah study sessions I often sense frustration about the fact that many laws in the Torah, Talmud and Code of Jewish Law are articulated in antiquated ways. A prime example would be this week’s parsha of Mishpatim with its discussions of slaves and pack animals - situations we hardly experience today. Here is one verse to ponder (Exodus 23:5): If you see your enemy's donkey lying under its burden would you refrain from helping it? You shall surely help along with him. When was the last time you encountered a donkey transporting a load for your enemy? The main idea of the law is that one must set aside grudges and help another despite the natural instinct to retaliate for perceived misdeeds - a lesson that resonates in 2019 as it did over 3,000 years ago. But do the specific details of “the donkey lying under its load” speak to us here and now? The Baal Shem Tov introduced an allegorical reading of the verse, extending the message to include a reference to the importance of preserving our physical health and fundamentally reframing our perspective on spirituality and holiness. ..."you shall surely help along with him" - purify the body, refine it, but do not break it by mortification. Generations ago pious men and women were under the mistaken impression that neglecting physical health was a pathway to spiritual greatness. Conversely, there are many of us today who feel that living a life of Torah and Mitzvot may pose a threat to our physical health and wellbeing or at least compromise our abilities to achieve financial stability and comfort. This novel teaching of the Baal Shem Tov busts the myth of religious asceticism and illustrates how the specific wording of the verse - while perhaps antiquated in a literal sense - is still very much relevant in our quest for a healthy and proper relationship with G-d. In my line of work I am frequently asked why G-d does not speak to us directly. If, for example, eating Kosher is so important, why do we not receive direct divine communication with all the detailed laws? If G-d could speak to Moses why doesn’t He speak to me? True. G-d could speak to us directly. But the last time it happened, we begged G-d to stop and never do it again! Fifty days after the wondrous exodus from Egypt the Jewish nation experienced “Matan Torah” - the Giving of the Torah at Mt. Sinai. G-d communicated the first two of the Ten Commandments to the millions of people gathered at the mountain - an experience so intense and transcendent that they clamored for the spectacle to end. And all the people saw the voices and the torches, the sound of the shofar, and the smoking mountain, and the people saw and trembled; so they stood from afar. They said to Moses, "You speak with us, and we will hear, but let G-d not speak with us lest we die." G-d approved of this arrangement and from then on all divine communication happened through Moses and the subsequent prophets. While the revelation at Mt. Sinai was necessary to prove beyond a shadow of a doubt that Moses and his spiritual heirs were the legitimate transmitters of G-d’s will, it was meant to be a one-time event - never to happen again. Why did G-d not make us all Moses-like, save us the trauma and continue to communicate with us directly? Because Moses and the prophets are not regular people and our life experience is not meant to replicate theirs. Most mortals are created with an affinity to materialism while prophets get over that stuff from the get-go. See how Maimonides defines a prophet here. But we are not all expected to live as prophets. In fact the Torah was given specifically to mortals susceptible to theft, murder, promiscuity, falsehood, jealousy and much more. Judaism is not an intense spiritual experience reserved for holy places and holy times. It is the very premise of life, integrated in every level of our consciousness, down the nitty gritty details of our eating habits and our most shameful impulses. Applying Torah laws and ideals in the most mundane elements of life is the whole reason we were created in the first place and if we were all prophets, that experience would be moot. So embrace your regularness and the opportunity to make our regular world a bit more divine. All it takes is learning some more Torah and doing another Mitzvah. Last month we took a road trip to visit my brother’s family in Wichita, Kansas. Since paper maps are a thing of the past, I opened the Waze app on my phone and discovered that the fastest and most direct route would be to drive on the 54 from El Paso straight to Wichita. With such simple directions I felt it unnecessary to pay attention to the app throughout the 12 hour ride. At Vaughn, New Mexico the 54 makes a sharp left turn, while continuing straight on the road takes you south on the 285 — the exact opposite direction of our destination. I missed the turn and when I finally glanced at Waze close to 45 minutes later, we were rerouted through Amarillo and Oklahoma City, with an extra two hours to our estimated arrival time. The story of Exodus features the very first GPS navigational system used by millions of people. The Torah records (Exodus 13:21–22) that as the Israelites left Egypt, G-d directed their journey to the Promised Land with a divine pillar of cloud during the day and a divine pillar of fire that led them through the night. Wherever these pillars went, the Israelites followed. It would seem logical for G-d to direct the Israelites — anxious to inherit their homeland — on the fastest and most direct route possible. An amateur reading of a map of the area reveals that the Israelites traveled a roundabout route to Israel. In fact, the Red Sea is in the opposite direction! Why does the Torah explain G-d’s rationale in determining the itinerary? Because it provides the most valuable lesson you may ever need in life. There were two options in mapping out the Israelite advance to Israel: The direct route or the roundabout route. Although the direct route was the swiftest, it was also the most challenging for the Israelites at the time. Since it was possible that they were incapable of handling the heat of battle and would retreat back to slavery, G-d steered them away from there. Even though the alternate route was also very challenging — getting stuck at the Red Sea wasn’t fun — G-d was certain they could handle it. Whatever your circumstances, no matter how challenging they may be, know that G-d leads us only on paths He is certain we can succeed. Even if you find yourself wedged between a roaring sea and a murderous army — there is certainly a way forward. Follow G-d’s instructions meticulously and even the worst situations may result in the greatest of miracles. As a child I was raised with the stories of Chassidic resistance behind the Iron Curtain. About the heroic men and women who sacrificed everything in order to educate their children Torah and Jewish traditions. Not only did they risk their lives to make Judaism available to their own families, they made superhuman efforts to educate and assist others in remaining loyal Jews. My ancestors were involved in these dangerous endeavors and I was privileged to hear first-hand accounts from the protagonists themselves. Clearly, they were directly inspired by the example set forth by the Previous Lubavitcher Rebbe, Rabbi Yosef Yitzchok Schneerson, whose Yartzeit will be observed on 10 Shevat, this coming Wednesday. He became the leader of the global Chabad Lubavitch movement in the spring of 1920, after his father’s passing, just as the Communists were beginning their reign of terror over Russia. As the authorities destroyed organized Jewish life throughout the Soviet Union, the Previous Rebbe transformed his community of Chassidim into a massive network of activists, ready to preserve Jewish life underground at all costs. The main targets of the anti-religious Soviets were the Jewish schools, and the Previous Rebbe and his Chassidim worked tirelessly, at great personal risk, to respond to this specific crisis. When a Jewish school was shuttered, a Chabad Chossid showed up in town and provided Jewish classes for the local children. When he was caught and sent to the firing squad, a replacement was arranged immediately. In 1927, the Previous Rebbe was arrested on charges of treason, and his life was spared only through tremendous miracles. His cardinal sin was providing Jewish education for the very young. Many wondered why the Previous Rebbe, a venerable scholar in all areas of Torah, and a mentor and teacher to so many, chose to endanger every other demographic of Jewish life for the sake of ensuring young children learned the Alef Bet. In this week’s Parsha, when Pharaoh realized that Egypt was on the brink, he tried negotiating with Moshe: Perhaps the adults can take a three day journey into the desert to serve G-d while the children remained as collateral to guarantee their return? Moshe refused, because although adults actually perform the service, the children are an integral part of the community. Later in the Parsha, when G-d communicates the instructions of Pesach and other Mitzvot, He mentions on three separate occasions that the children will ask questions about the rituals and we are obligated to engage them on their level. Because education is the cornerstone of Judaism. Just as in times of religious persecution the Previous Rebbe was ready to sacrifice everything else for the sake of the youth, today, in times of religious freedom, the Jewish education of our children must be our greatest priority. His good cheer was a pleasure and our visit was quite enjoyable for both of us. He had so much wisdom to share and we had the opportunity to do the mitzvah of Tefillin together. But the most important lesson I walked away with was his perspective on circumstances: They are defined by your response. In this week’s parsha we learn of when the Jewish people in Egyptian slavery reached rock bottom. It did not happen when there was no apparent redeemer on the horizon. Moshe had already arrived in Egypt with a message of freedom and had been verified by the experts to be legitimate. However, when he started fulfilling G-d’s mission to impress upon Pharaoh to release the Jewish slaves, everything went downhill from there. Pharaoh made life unimaginably miserable for everyone and even Moshe was mortified with his failure. G-d sent Moshe to the people with a newly worded message of freedom that surpassed all previous messages in confidence and divine revelation - but alas, his words fell on deaf ears. The situation was so bleak that they could not bring themselves to pay attention to the confirmed messenger of G-d. It was at this low moment that everything started to change. The ten plagues commenced - a watershed moment in world history. Never before had the world witnessed such clear divine intervention in nature. For example, during the first plague, the water did not just merely turn to blood. It became blood only for the Egyptians and not for the Israelites. This had nothing to do with different locations and water sources for if an Egyptian forced his Israelite slave to sip out of the same glass of water/blood drawn from the Nile River together with him, the Egyptian would drink blood and the Jew would drink water. The only way the desperate Egyptians were able to drink water during the week-long plague was if they would buy it from the Israelites. The rest of the plagues were no less wondrous and the ultimate redemption that followed has ramification till today. The lesson is clear. When the circumstances are the worst possible, all is not lost. Respond to them as challenges meant to be mastered and the results will be as wondrous and redeeming as Passover. Apparently they more fun that way as well.